Associated with anti-ageing effects (disease prevention, reduced inflammation, decreased mortality). Higher bioavailability than other forms. Recognised anti-inflammatory, antioxidant and immune-protective benefits. • it breaks down and is eliminated from the body more slowly, with a half-life around seven times longer than that of resveratrol. ¤ This valuable substance has been the subject of numerous studies emphasising its considerable benefits to human health. These studies have focused on the “trans” isomer of pterostilbene. ¤ Pterostilbene is naturally present in blueberries but at levels much too low for it to be fully active and exert all its benefits. You would actually need almost 100 kilos or so of blueberries to obtain a clinically relevant amount of pterostilbene. ¤ The journal Apoptosis reported on a study carried out in 2012 which highlighted that pterostilbene protects against atherosclerosis (hardening of the arteries). ¤ In studies on mice and human cells, pterostilbene prevented accumulation of LDL-cholesterol and protected against oxidative stress, a biological process considered a key factor in the development of cardiovascular disease. Its effect on blood lipid profiles conferred much higher protection against stroke than Ciprofibrate, a drug widely prescribed for hypercholesterolaemia and which acts like pterostilbene as an agonist for nuclear receptors with PPAR- α transcription factor function. ¤ By improving blood flow, pterostilbene also normalises diastolic and systolic blood pressure. 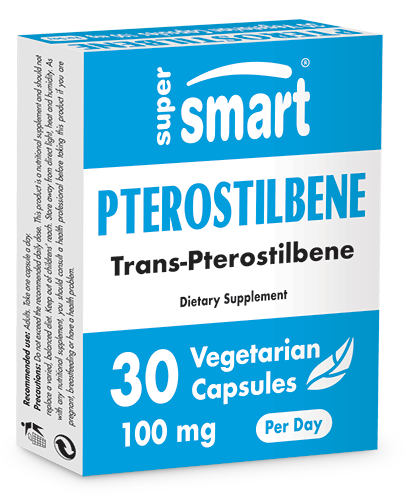 ¤ Pterostilbene improves overall concentration and short- and long-term memory. It has a calming, de-stressing effect which relieves anxiety and nervous tension. ¤ But its properties appear to extend still further. Indeed, a study on mice published in 2012 (in Neurobiology of Ageing), showed that it had a protective effect against Alzheimer’s disease and age-related cognitive decline. The study’s authors attribute the improvements shown in cognitive tests to a reduction in inflammation-associated factors. ¤ Pterostilbene’s antioxidant power enables it to neutralise free radicals associated with oxidative stress and to maintain the antioxidant status of elderly cells. Researchers have demonstrated in rats that pterostilbene can reduce blood sugar by around 56% (making its efficacy comparable to that of Metformin, a drug widely-prescribed for type II diabetes), while restoring insulin and glycated haemoglobin (HbA1c) to normal levels. ¤ Pterostilbene thus improves carbohydrate metabolism and its energy-regulating mechanism means it can be easily incorporated into weight loss programmes. • more rapid production of nitric oxide via the eNOS (endothelial nitric oxide synthase) pathway. ¤ Research conducted in Chicago showed that pterostilbene acts as an inhibitor of the P450 enzyme which activates ‘pro-carcinogenic’ substances that can convert cigarette smoke and certain pesticides into carcinogens. ¤ Other studies from 2012, published in a Journal of Surgical Research review, showed that pterostilbene inhibits the growth of some forms of cancer (breast, colon and prostate), through modification of the cell cycle, induction of apoptosis and inhibition of proliferation of other cancer cells or metastasis. Other research suggests its strong antioxidant potency is an important factor in these mechanisms. Given the multiple benefits of pterostilbene, this bioactive compound also features in the formulations of potent antioxidant blends such as the anti-ageing product Resveratrol Synergy. Along with pterostilbene, this contains trans-resveratrol, the active form of resveratrol, polydatin, a resveratrol glucoside, and fisetin, which has a stabilising effect on resveratrol. Discover too, the formulation AntiOxidant Synergy which combines 12 natural extracts with antioxidant properties, including an extract of Japanese knotweed (Polygonum cuspidatum Sieb.) standardised to 98% resveratrol. Pterostilbene therefore has anti-inflammatory, anti-neoplastic and antioxidant properties. It acts via fundamental biological interactions to control gene expression and modulate enzyme activity. It has a beneficial effect on the genes involved in the development of cancer, atherosclerosis, diabetes and inflammation. Thus it is a nutritional supplement of the first order that is easy to use, either on its own or in combination with resveratrol, with which it acts synergistically on longevity genes, enhancing resveratrol’s anti-ageing benefits and preventing or combatting numerous disorders harmful to human health. PteroPure® is the only patented, clinically-studied form of trans-pterostilbene. Its purity is over 99%.